This property was situated only a few hundred yards from the River Nene in Thrapston, near Kettering in Northamptonshire. And, while it is certainly nice to live next to a river, it can cause long running damp issues for certain properties, as was the case with several houses along this road. I was particularly aware of this, having treated a floor in a similar area of the town. 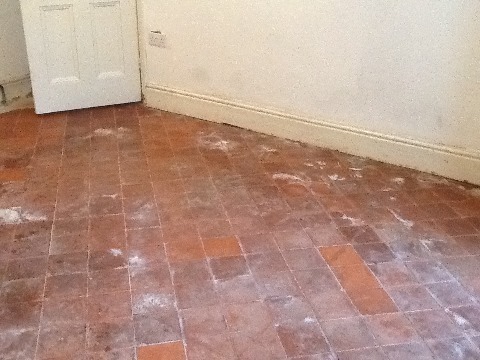 This client had recently uncovered a Quarry tiled floor which had remained hidden under Linoleum for a long time. She wanted professional help and advice on restoring the floor back to looking its best, and was especially aware that it was marked by white patches of efflorescence (mineral salts). I explained to the client that the damp issues can never be completely rectified without building work being undertaken to install a damp proof membrane. Unfortunately, this is a very expensive process. Nonetheless, the following is an account of the results which can be achieved with badly stained Quarry tiles using professional methods and products. I arranged a date to do the work on my return the first stage in the floor restoration was to give the tiles a deep clean. This was done with a high alkaline cleaner known as Tile Doctor Pro Clean, which is applied to the floor and left to dwell for a short period, before being agitated with black stripping pad fitted to a rotary floor buffing machine. This strips away any old sealer and lifts away trapped dirt. The soiled solution was then rinsed away using clean water, and the resulting slurry was soaked up using a wet vacuum. 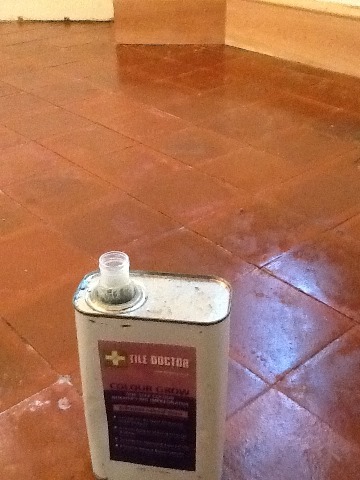 Following this I gave the floor an acid rinse with Tile Doctor Grout Clean-Up in order to neutralise the mineral salts. Then, to draw the contaminants completely out of the tiles – and to assist with the cleaning process – I applied the heat of a steamer. To complete the cleaning process the floor was rinsed down again which was again was removed with a wet vacuum which extracted as much water from the floor as possible. I then installed a powerful industrial dehumidifier and allowed two weeks for the floor to dry completely. 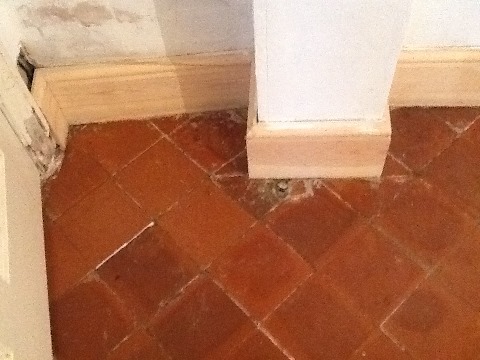 However, I was aware that given the extent of the damp issues that this might not, in fact, be long enough. Upon my return to the house, I took further damp meter readings to discover that the floor was indeed still damp. 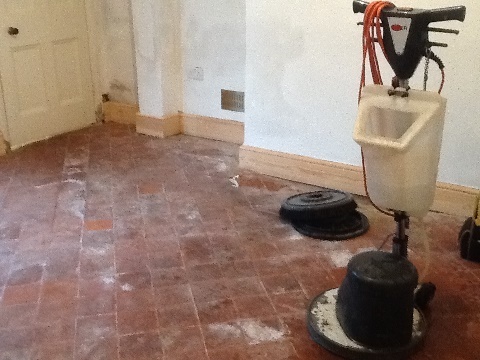 I suggested that the best course of action in this scenario was for my client to carry out daily mopping with a mild acid solution of Tile Doctor Grout Clean-Up for a period of three weeks to help tackle the inherent salt issues that had been present for many years. After the three weeks had passed, I was able to apply just a single coat of Tile Doctor Colour Grow, which is a breathable impregnating sealer that allows for effective moisture vapour transmission. It also contains colour intensifying properties to help enhance the natural shades in the Quarry stone. The client also purchased some Colour Grow sealer for her to apply herself later in the Spring, as the floors were still too damp for the two to three coats that I would normally apply. 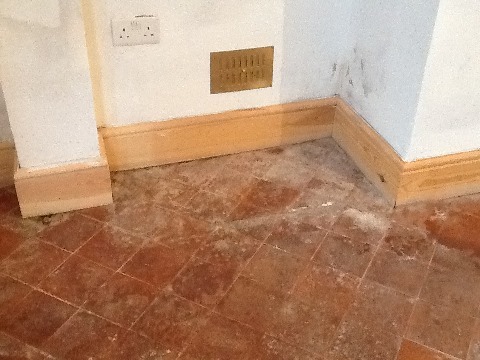 The photographs show what can be achieved with Quarry tiles suffering from inherent damp issues. Although they may still look slightly patchy, rest assured that by the Spring they will have dried out sufficiently enough to apply more sealant – this will achieve the desired finish.